Cycling along the Melbourne bike paths, following the creeks and the Yarra, or along the Bay is real fun and instant relaxation. You actually dont feel you are in the city any longer on many of these paths. Many trails are poorly marked and it is a good idea to carry a bike map, so you dont end up somewhere else. Bike maps, some of them free, are available from bike shops. Many of the Melbourne bike paths you can ride one way and catch the train the other. That way you get to see more and feel 'you are going somewhere'. Trains are free for bikes. The Capital City Trail describes a 29 km loop of sealed paths around the city. It has two parts, the eastern twice as long as the western: From the Princes Bridge it follows the Yarra around Richmond and Abbotsford; at Dights Falls it continues along Merri Creek to Rushall Station, crosses the northern suburbs and Royal Park on the old Inner City Railway path, continues along Moonee Ponds Creek to the Docklands and Southbank. Its east section is very scenic, with a gentle slope towards the city on either side of the loop. The Merri Creek Path winds 19km from Dights Falls (Capital City Trail) along the Merri Creek to the northern Ringroad. 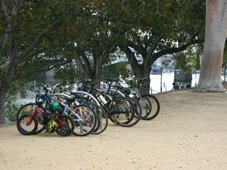 It is a very popular inner city riding and foot path, and can get crowded on the weekends. A great coffee stop is the Ceres Environment Park in East Brunswick. Alternatively, you can cut across on the Western Ringroad Path to the Moonee Ponds Creek Trail. This is a 25km trail from the city. You can get onto this from the Docklands or Flemington Bridge at Royal Park. It follows the Moonee Ponds Creek all the way to the airport, where you can continue further on the Woodlands Park Path, or you can turn off onto the Shankland Valley Track, or take the train from Broadmeadows station. The Main Yarra Trail is one of the best and most pleasant Melbourne bike trails. Towards the northeast, the Main Yarra Trail and Diamond Creek Path follow the Yarra and then the Diamond Creek through natural bushland from the Fairfield to Eltham. We even saw a Platypus playing in the Yarra looking down from a footbridge along the trail. In the other direction, the Main Yarra Trail to the city follows the Yarra from Fairfield to the Melbourne CBD - without ever having to cross a street! The Darebin Creek Path is harder to get to by train  so perhaps better for a return trip. It turns off the Main Yarra Trail at Alphington (train station) and follows up the Darebin Creek to Bundoora Park. Very pleasant and not overused! After that it gets a bit patchy, but then has very nice sections around Epping. The Eastern Freeway Path goes all the way from the Yarra Bends Park on the Main Yarra Trail to Ringwood (train station). Passing through Box Hill and Blackburn you can either stay on the straight path or wind your way around the more scenic Koonong Creek trail. From Ringwood you have the option to continue on the Mullum Mullum Creek Path to North Ringwood, or to turn south and link up with the Dandenong Creek Trail. You can cut across from Fairfield on the Eastern Freeway Path to Malvern (train station) on the Anniversary Outer Circle Trail. This is a great cross connection, with albeit a few (safe) road crossings. The Gardiners Creek Trail turns off the Main Yarra Trail at Toorak (Heyington train station), and follows the Monash Freeway - one of Melbournes busiest cycling paths -and then the Gardiners Creek from Malvern up to Blackburn (train station). It is 18 km long. Alternatively, you can continue the ride along the freeway, from East Malvern station on the Scotchmans Creek Path. This takes you via Glen Waverley all the way to Jells Park on the Dandenong Creek trail. From the city to Jells Park it is around 32km. You can continue riding from Jells Park to Ferntree Gully in the foothills of the Dandenongs on the Ferny Creek Path (includes some road travel) or the Blind Creek Path (a bit longer) - a very scenic area. Another Dandenong trail is the Railway Ride along the train tracks from Bayswater to Ferntree Gully, Upwey and beyond. From there you can connect into the great network of the Lysterfield Park Paths that crisscross around the park and lake. The Dandenong Creek Trail is a 43km long relaxing north-south trail. It takes you from Bayswater in the east (you can also connect to it from Ringwood), all the way to Carrum on the Bay. You can shortcut this a bit via the Eastlink Trail. Both ends have train stations. Very worthwhile trip! Further east into the countryside, you can take the Lilydale to Warburton Rail Trail, a 40km converted rail trail and picturesque country ride. You can get to Lilydale by train. The trail goes via Mt Evelyn, Woori Yallock and Yarra Junction to Warburton that has various places where you could stay the night for very pleasant weekend away. Riding from the city to the beach, first take the on-road cycle path along St Kilda Road, then turn right into Albert Road. There is a bike path along Albert Park, which turns on-road in Kerferd Road. This takes you to the beach and Bay Trail. Alternately, you can ride through Albert Park and take the Fitzroy Street, St Kilda, bike path to the beach. Riding around the small streets of South and Port Melbourne is generally pleasant. One of the Melbourne bike paths goes from the Entertainment Centre from Normanby Road through the Hester Reserve to the Station Pier, linking you with the Bay Trail. The Bay Trail stretches along Port Phillip Bay all the way from Altona in the west, to Carrum in the southeast.. During weekends and public holidays you can cross the Yarra under the Westgate Bridge with the Punt, a small bike and person ferry  on other days you have to take a detour around Footscray Road. The Bay Trail is the beach lovers trail. You may want to just ride some sections of it. A nice section is from Elwood to Sandringham which is about 19km. From the Bay Trail at Elwood you can turn off to the Nepean Highway Path that takes you all the way to Moorabbin. There is a bike trail along the whole length of the Ringroad, which connects the Mooney Ponds Trail and the Maribyrnong River Path, and then the Kororoit Creek Path. The Maribyrnong River Trail is still one of the undiscovered Melbourne bike paths, making it less crowded and easier riding. It is 28km long and starts at Southbank (Flinders Street or Spencer Street stations), goes through the Docklands, Kensington (South Kensington station) and Flemington, and then along the Maribyrnong River to Brimbank Park in East Keilor. It is a very attractive ride, with a country and early settlement feel, not so much a bush setting. The Kororoit Creek Path and Derrimut Trail make a nice tip up and down. It turns into the Millbank Drive Trail in Deer Park. It is accessible from the Sunshine train station. From the Ringroad you can also access the 24 km long Federation Trail, the most important connection to the West, which takes you to Werribee (train station). You can also access this from Newport station via the on-road path along Mason Street. There is an on-road bike bath that connects the east end of the Federation Trail with Altona. There you get great cycling around the Cherry Lake Path and the Bayside West Path, all the way to Altona Meadows. You are trailing along the wetlands and bird sanctuaries and get to see many beautiful, many migrating, birds  depending on time of the year.